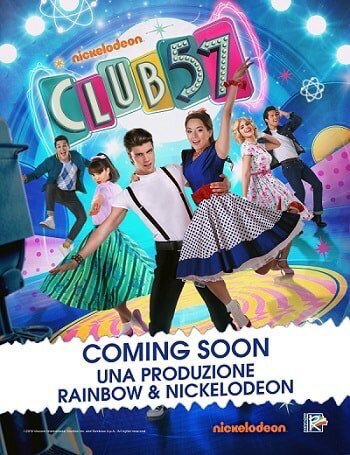 Nickelodeon Latin America (Latinoamérica) will premiere Club 57 on Monday 6th May 2019 at 20:00! The series will launch simultaneously on Nickelodeon Latinoamérica and Nickelodeon Brazil (Brasil). Club 57 made its world premiere on Rai Gulp in Italy in primetime on Monday 15th April 2019. Club 57 is a brand-new time-travelling themed series that tells the story of a 14-year-old tech loving girl who accidentally travels back in time. Stuck in the past, she discovers her passion for music, and falls in love. The first season of Club 57 will feature 60 one-hour episodes. Nickelodeon is co-producing the series with the Italian production company Rainbow Group (Winx Club, Regal Academy, 44 Cats, Mia and me, Maggie & Bianca Fashion Friends). 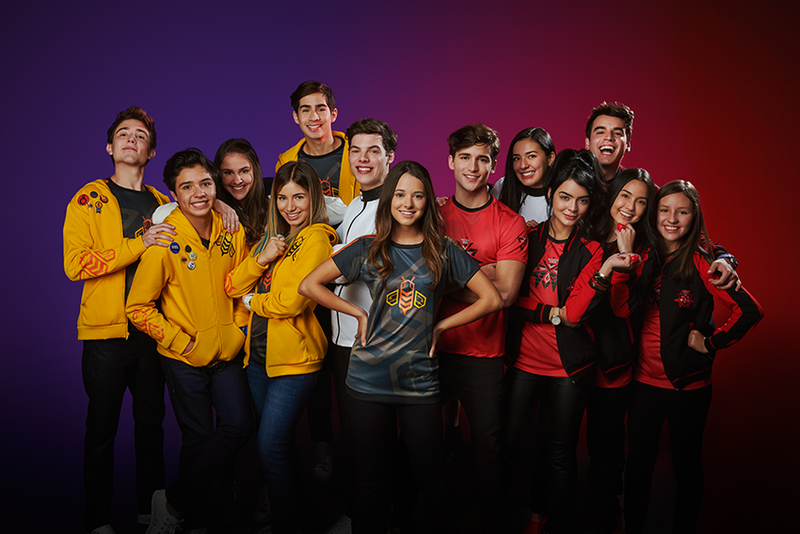 Club 57 will launch as Nickelodeon Latinoamérica celebrates 10 years of local productions, and will also mark Nickelodeon's 10th locally produced show for audiences in Latin America and Brazil. Club 57 is recorded at Viacom International Studios (VIS) in Miami, Florida, with exterior shots filmed on location in Martina Franca in Puglia, Italy. Update (27/3) - Club 57 has already been nominated for an award before it even premieres! Club 57, along with 44 Cats (44 gatti), a series from Club 57 co-producer Rainbow Group which Nickelodeon has the worldwide rights to, and Find Me In Paris (Cercami a Parigi), a drama series which airs on Nickelodeon UK & Ireland, have each been nominated for two awards in Cartoons on the Bay's (Festival Cartoons on the Bay) Pulcinella Awards 2019! Congrats to all the cast and crews who work on both shows, as well as to Nickelodeon, Rainbow Group and ZDF! Club 57 will feature a truly pan-regional cast, with actors from Argentina, Colombia, México, and Venezuela. The cast will also feature actors from Italy. Club 57 will star Isabella Castillo (Yo Soy Franky, Vikki RPM, GRACHI) as Amelia; Andrés Mercado (Yo Soy Franky, GRACHI) as Manuel; Simoné Marval as Isa; Mauricio Novoa as Checho, Gabo Lopez as Oso; Evaluna Montaner (daughter of the renowned singer-songwriter Ricardo Montaner) as Eva; Riccardo Frascari as JJ; Carolina Mestrovic as Vero; Laura Rosguer as Maca; Fefi Oliveira as Mercedes; Martin Barba as Aurek; Jorge Roguez as Rene; Luis Mayer as Xavier; Sebastian Silva as Ruben; Gael Sanchez as Cesar; Adriano Zendejas as Victor; Martina Lavignasse as Diana; Jesus Nasser as Fernando; Valeria Arena as Camila; Jonathan Quintana as Miguel; Santiago Bidart as Abel; and Frank Fernandez as Andrés. Singer Sonny Monreal will also feature in the series as a teacher. Nickelodeon are working with the Montaner family and the Sony music label to produce the Club 57 soundtrack, which will feature 16 original songs. In addition to being its 10th local production, Club 57 also marks Nickelodeon's most ambitious and biggest original production to date since they started work on Isa TKM in Venezuela a decade ago. The show takes up two whole stages at Viacom International Studios (VIS), using more than 22,000 square meters of set design and featuring a regular cast of 22 actors. Tatiana Rodríguez, Senior Vice President (SVP) & Brand Head, Kids & Family of Nickelodeon Latinoamérica, sums it up: "For us this is a blockbuster." "And what better way to celebrate this decade than with the biggest project we've done so far," Rodríguez added. When Club 57 was picked up for a series by Nickelodeon, the show originally had 40 episodes, however, to give the script a greater depth, Nickelodeon rewrote the script a bit so that the protagonist was an immigrant from an Italian family in the 50s. One of the great challenges was to locate the story to the 1950s. "For the kids of today, the '50s is something prehistoric, but we thought it was very fun to be inspired by the aesthetics of those years, but modernising the colours, and I think that a visually spectacular series came out," explained Rodríguez. The news follows Nickelodeon Latinoamérica greenlighting a second season of its popular eSports-themed drama series Noobees, in co-production with Mediapro. The news was announced at NATPE Miami 2019. Noobees season two is written by Argentine screenwriter Marcela Citterio, whose hits include Nickelodeon's tween/teen favs Yo Soy Franky and Chica Vampiro. The series will be shot on-set and on-location at Mediapro's production facility, Televideo in Bogota, and will feature images from Mediapro's Professional Videogames League (LVP), the biggest e-sports league in Spain and host of major online and offline tournaments for games such as League of Legends & Call of Duty, among others. A start date for production is yet to be announced. Este año, la señal infantil de Viacom festeja una década de producción original local en América Latina. Tatiana Rodríguez repasa para ttvnews varios anuncios y su proyecto más ambicioso hasta la fecha. "La segunda temporada está escrita por Marcela Citterio, guionista de series como Yo soy Franky y Chica vampiro, grandes éxitos de Nickelodeon", adelanta la ejecutiva, y adelanta: "Aún no hay fecha para iniciar las grabaciones, recién estamos armando el plan de producción". Nickelodeon Latinoamérica anunció este martes que su serie original Club 57 llegará a su pantalla el próximo lunes 6 de mayo a las 20:00 horas. La serie contará además con un preestreno exclusivo el viernes 3 de mayo en Nick Play, la plataforma digital del canal. Club 57 sigue las aventuras de Eva y su hermano Rubén, quienes accidentalmente se transportan al año 1957. Hacen todo lo posible para volver a casa, hasta que Eva se enamora de JJ y decide quedarse en el pasado, desencadenando un efecto mariposa que cambia sus vidas para peor en vez de mejor. Con una mezcla de música, baile y aventuras de viajes en el tiempo, Eva debe ahora ingeniarse la manera de volver al presente sin renunciar a su primer amor. La banda sonora de la serie incluye 15 canciones originales compuestas por Ricardo Montaner, Ricky y Mau, Camilo Echeverry y Evaluna Montaner incluyendo el tema musical de la serie, Club 57 y El tiempo corre al revés, la cual ya lleva más de 650.000 reproducciones en YouTube. Escrita por Catharina Ledeboer, la serie es una producción de Viacom International Studios y Rainbow Group. Además de Nickelodeon, se verá en Italia por la RAI. ¡Echale un vistazo al trailer oficial de Club 57! ¡NO TE PIERDAS Kallys Mashup de Lunes a Viernes en Nickelodeon! More Nick: Viacom Américas Unveils Nickelodeon Latin America's 2019 Highlights at Upfront Presentation in Mexico! Additional sources: Google Translate, DeepL Translator, FormulaTV, Google.co.uk. Follow NickALive! on Twitter, Tumblr, Reddit, via RSS, on Instagram, and/or Facebook for the latest Nickelodeon Latin America, Nickelodeon Brazil and Club 57 News and Highlights!